Please click below to visit our Kickstarter project page for Power Stacker, and pre-order a production model! 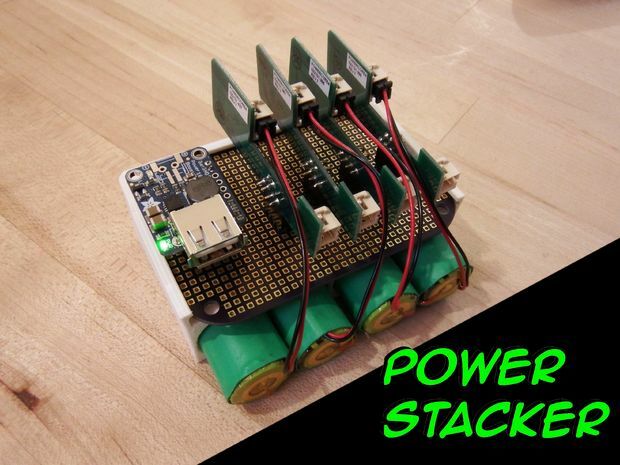 Power Stacker is a portable, modular, USB rechargeable lithium-ion battery pack. Stack them together for power hungry projects or separate them for smaller projects with this modular system. The Gerber, BOM, and .STL files are available below. Power Stacker does what other USB rechargeable batteries have failed to do, and that’s the ability to combine together for increased battery capacity or separate in to many small batteries for smaller projects. You can literally use the same Power Stacker batteries for many years across many applications! Another unique feature of Power Stacker is that each battery receives its own charge controller, which guarantees true cell balancing and makes sure that each battery is charged to the right voltage in real-time even while charging and/or discharging. After launching a successful Kickstarter project called Solderdoodle Pro, I realized that the same battery technology used to melt solder could be used to solve the problem of trying to find the right battery and having to constantly purchase new batteries for every new project. Combined with my knowledge of 3D printing, I created a case for the battery that can be printed, modified, and shared! Power stacker is also compatible with Open Source DC-DC converters like Adafruit’s Power Boost 1000. How does the battery stack work? Low forward voltage/high current diodes on the charge controller board are installed on the input and output of the circuit, which prevent cross talk between multiple power sources and between the output of the charge controllers. This allows the interconnections between the input and output pins of each charge controller board to become bus bars allowing the voltage to remain the same and the current to multiply. The highest voltage battery in the stack will discharge the most until the other batteries reach close to the same voltage and they too will begin to discharge at the same rate, which multiplies the current output of the battery pack. *WARNING: Be careful when handling any Lithium-Ion battery because shorting the battery can cause burns. Always wear safety goggles. Please use recommended battery and circuit components because of the higher 2000mA max battery charge current involved. 3D printed parts may warp under high temperatures.